Australia leads the way in making interesting blends of Cabernet Sauvignon and Shiraz wines. Many years ago we found the Aussie Shiraz wines coming to the U.S. market to be styled along the lines of good California Cabernets. 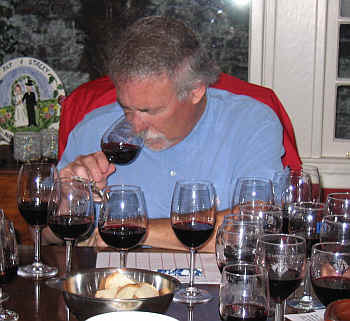 They relied a lot on oak and often showed a concentration and intensity similar to top Napa Valley Cabernets. The first blends of these two varietals took place, we understand, in the mid-1950s. 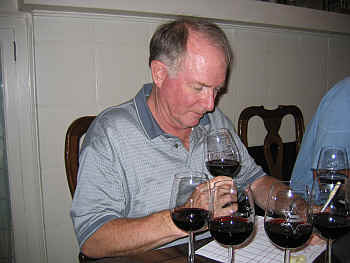 The Redman vineyard is credited with the first Cab/Shiraz blend, with wineries such as Saltram, Yalumba and Penfolds also making early successful efforts with this sort of blend. The legendary winemaker of Penfolds, Max Schubert, claimed one of his best wines ever was the 1962 Penfolds Kalimna bottling featuring this blend. Today there are hundreds of Cabernet/Shiraz blends coming from Australia. Some are budget-priced, while others command premium dollars. 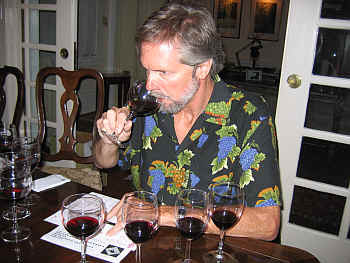 Grant Miller wanted to sample a set of Aussie Cabernet/Shiraz blends, so we assembled a set of wines from a variety of sources. American wine critic Robert Parker often has high praise for the wines of the import company "The Grateful Palate," so we included an entry-level bottling from that portfolio along with two higher end offerings. Then we included a couple of wines from the humongous "Rosemount/Southcorp" firm purchasing wines from old-time producers Lindemans and Penfolds. 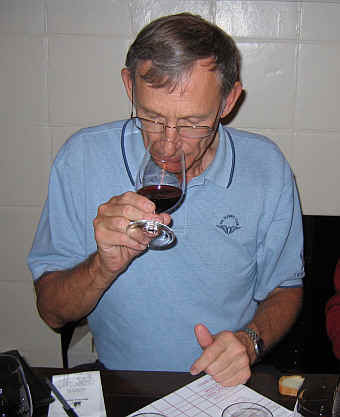 A family-run estate wine from the Potts clan was included as Bleasdale makes good, reasonably-priced wines. We also included a Grant Burge bottling, as he's a well-respected vintner in the famed Barossa Valley. A couple of wines led the way in this horse race and one wine was a clear loser. 8th Place: RUSDEN 2004 Barossa Valley "Ripper Creek"
If you're looking for a wine to accompany a vegetarian meal that shows lots of vegetal and herbal notes, then this may be your wine. I thought it might have a bit of sweetness, adding to the strange character of this odd entry. At $45 a bottle, perhaps they should rename it "Rip-Off Creek"? Green beans, sweet pea and other items from the farmer's market make for a most curious wine. 7th Place: YARRAMAN 2004 "Rip Snorter"
At least this dull little wine isn't $45 a bottle! You won't find much "wine" here in this standard issue of "plonk." It's a flat-tasting red wine...I thought it might have some acidity added to it to prop it up, but they still couldn't save it. Like the group's last place wine above, this is over-priced. Even at $8.99. The nose is mildly interesting, showing some dark fruit and a bit of cedar. I found a note reminiscent of plums on the second pass through this flight of wines. It's less interesting on the palate, being a rather ordinary, medium-light bodied red. Not much of a finish here. Green Point, by the way, is a label affiliated with the Chandon group of wineries. Ho hum. 5th Place: GRANT BURGE 2003 Barossa Valley "Nebuchadnezzar"
There's a nice woodsy tone on the nose of this wine, also featuring red and black fruit aromas. Attractive on the nose, this is a medium+-bodied red with nice fruit on the palate. It's a bit aggressively tannic and perhaps a shade overly astringent. As with most of the wines in this line-up, I was reluctant to award this wine even one star on my three star scale. No stars signifies a wine of ordinary or standard quality. 4th Place: PENFOLDS 2002 South Australia "Bin 389"
The generally reliable Penfolds brand showed nicely here, with good, woodsy notes on the bouquet and a light touch of a violety fragrance on the nose. 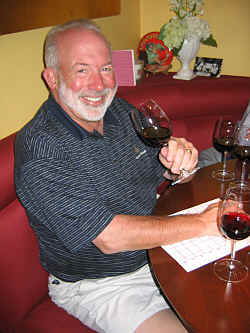 It's a medium-full bodied red wine with good structure and better balance than the Grant Burge wine above. There's a modest amount of tannin here, but the wine has the fruit to match it. I didn't find any great depth or complexity here, but the wine is reasonably satisfying and nicely drinkable now and likely to be good for another 3-8 more years. One star. Here's a charming wine which displays lots of bright, berryish fruit and violets on the nose. It's very typical of Australian wine and I found this pleasing. 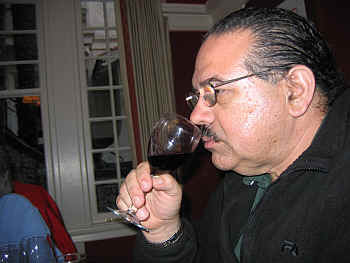 The wine is dry and has nice acidity, not being flat and not being sharp. It's a medium weight red wine with lots of berry fruit flavors and a juicy aspect to the flavors. There's a nice oak element here, too. Very drinkable now and this can probably be cellared for a few years. Very good value...(what a concept!) I gave this a one-and-a-half star rating. Nice wine. 2nd Place: LINDEMANS 1999 Coonawarra "Limestone Ridge"
This wine started out with lots of woodsy notes on the nose and this blossomed handsomely over the course of the tasting. For me, it easily out-distanced the rest of the group of wines. There's, perhaps, a mildly resin-like note from the oak and wood is in abundance here. The wine, amongst a bunch of younger offerings, showed not so much as an "older" or "mature" wine, but it's a more complex bottle. The nose is dominated by oak, though. I found some pleasant dark fruit elements on the palate and the wine is quite complex, deep and layered. For me it was more Cabernet-like than Shiraz. I wrote "There's some soul to this wine." It probably can be cellared for another 3-8 years. Two stars+. The nose of this wine is quite striking and perhaps this attracted the attention of a number of the tasters. It reminded me of peppermint toothpicks with some dark fruit aromas lurking behind the mintiness. I did not find this totally dry...interestingly all three wines from importer Dan Phillips' "Grateful Palate" portfolio had question marks on my score-sheet with respect to being dry. The flavors reminded me of candy...Jujubes or Black Crows...and the sweetness shows up on the palate. Interesting and curious, but not my style of wine.